This year marks my 30th year at Arroyo Arabians – literally “living the dream”. I have always said, one of the things that makes the Santa Ynez Valley so amazing is that we are all so grateful to live here and share not only the beauty of the Valley, but our beautiful Arabian horses with friends and visitors. Whether you are in the Santa Ynez Valley, or planning a trip, please make arrangements to visit some farms. We are always happy to share our love and knowledge of the Arabian horse. This directory is intended to be shared and used as a guide to the Arabian farms and local businesses who willingly support SYVAHA each year. Last year brought us the first full slate of the Santa Ynez Futurity classes held at the Santa Barbara Fall Show. We had a great turn out of gelding for the Yearling Halter classes, 2 year old In Hand Trail class, and 3 year old Ridden Trail class with a payout over $32,000! Than you to all who participated. we will keep you posted on our plans to hold the 2017 Santa Ynez Futurity at the Santa Barbara Show. The year also came with some losses. We lost Santa Ynez Valley breeder and friend, Sigi Siller last summer. Sigi and her daughter Janina Merz have bred champions worldwide at Om El Arab in Santa Ynez for more than 30 years. Janina and her family will carry on one of the oldest and most successful breeding programs in the country. Sheila Varian was also active in our club, and a persona friend and mentor. Sheila was a world renowned, lifelong breeder and horsewoman and in the Cowgirl Hall of Fame. She passed away last spring. 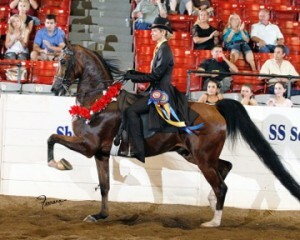 Angela Alvarez is carrying on the Varian Arabians breeding program. Sheila and Sigi are legends in the Arabian breed, and live on through their breeding programs. SYVAHA is proud of our own Flora ElmColone on being elected President of the Arabian Horse Youth Association, and also selected at the Arabian Horse Association Youth of the Year! Congratulations Flora! Please like us on Facebook and sign up for our Newsletter and here’s to a year filled with friends and Arabian horses! What could be better? The Santa Ynez Valley Arabian Horse Association originally began as an Arabian Breeders club over 30 years ago. It was formed to bring together people interested in advancing and promoting the Arabian and Half-Arabian horse. It has since evolved into an AHA Region 2 affiliated association that host new and exciting events such as The Arabian Foal Festival, The Santa Ynez Futurity and The Arabian Breeders Celebration tours. Regional and National Championship Competitive Trail rides, a variety of general meetings, and a membership organization for people who show, race, breed, or pleasure ride their Arabian & Half Arabian horses. To our visitors, please use the website to find or breed your dream horse, join our club, or plan a trip to the Santa Ynez Valley. Internationally acclaimed Arabian breeding farms and nationally accomplished trainers proudly call the Santa Ynez Valley their home. In fact, we believe there are more Arabians per square mile here in the Santa Ynez Valley than anywhere else in the United States. Whether you are just beginning your endeavor into the world of Arabian horses, or are a lifer, please take the time to contact some of the Arabian horse owners in the Santa Ynez Valley. You will find people who are excited to share their stories and experiences. To our members, this website is provided as a tool for you to use. Please let the world know about your Arabians! We could not have created this site without you – thank you for your support.